"Two in Less Than Two"
Back on April 16, around 4:30am, rain was going sideways with a 40mph northwest wind. Not good turkey hunting weather. I took one look outside and went promptly back to bed. I had been watching the forecast closely, and I knew that the weather would clear up by around 10am. I got to the HSP property about 10:30. I knew this property quite well and took my time getting to my favorite spot. I went very slow in case there were turkey's already where I was going. 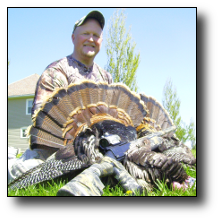 I got set up with a Killer B tom decoy and a hen decoy. The new killer B has a tail fan that can be moved by pulling a string attached to the front of the decoy. At 11:45 I thought I heard a bird. I hit the slate call and sure enough, 600 yards across the field in the trees I heard 2 toms gobble. They both came out of the trees in full strut. I was watching them through my binoculars and when I pulled the string on the tom decoy (to pull his tail feathers down) they both came out of strut and started running at my decoys. I dropped the string, and readied my gun. But as soon as the decoys tail feathers went back up, the toms stopped and went into strut again. "Hummm I thought," "I better keep that decoys tail feathers down." I pulled on the string, and put it under my foot to keep the tail feathers down. As soon as I did that, they came out of strut and started running right at me. When the farthest bird got into gun range I shot him. The bird that got there first was only 20 yards away when I dumped the other one. The closest bird jumped up and ran by the bird I just dumped, and when the bird on the ground started twitching the other one stopped and looked back at him. That gave me enough time to get the second bird. From the first gobble, to two birds dead on the ground, took less than two minutes.